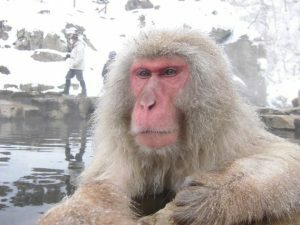 The Snow Monkey, also known as Japanese Macaque (pronunciation: muh-KAAK) and Japanese monkey, is a species of terrestrial (as opposed to many ‘arboreal’) Old World monkey. 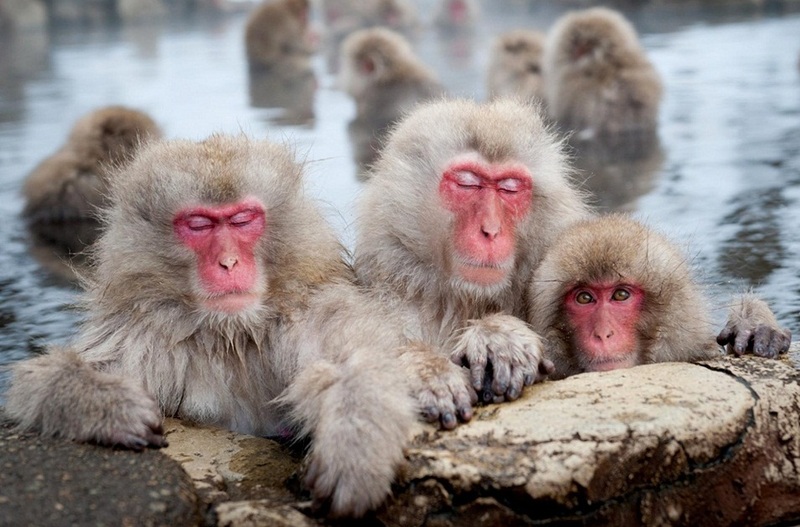 These red-faced monkeys are found in parts of Japan in large numbers. They are considered as crop pests in some parts of their range. A report from 2011 estimated that, in an average, they cause crop and infrastructure damages of more than $15.4 million each year. Size: They are medium-sized, but can vary, ranging in length between 20 and 23 inches, depending on the region, with the population from the southern parts being smaller compared to those from the colder, northern regions. 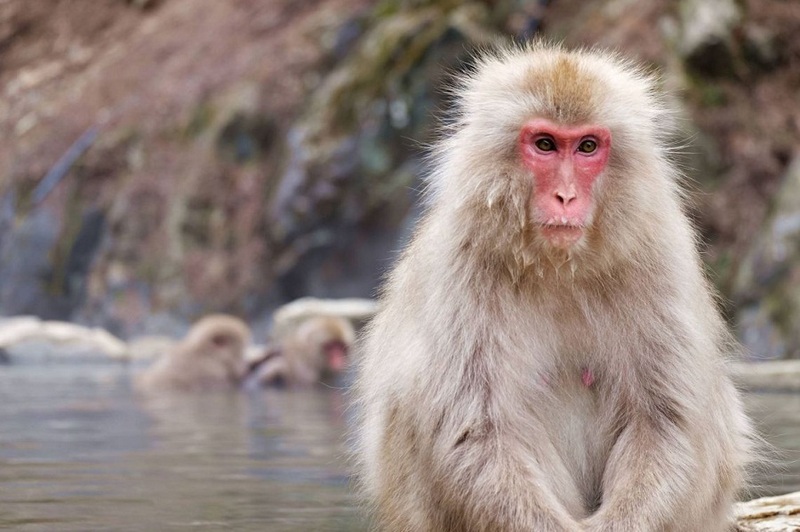 Weight: On average, snow monkeys weigh between 25 and 40 pounds. Body Hair: The entire body of the snow monkey is covered with fur. The coat color varies from brown to white, but is usually brownish gray. Tail: They possess short stumps in place of tails averaging to 3.64 inches in males and 3.11 inches in females. Teeth: They possess two rows of sharp teeth that can tear both plant and animal matters easily. Sexual Dimorphism: There are no visible differences between the sexes. In the wild, the maximum recorded longevity of this species is 28 years, whereas, in captivity, or as a pet, they can live for up to 32 years of age. 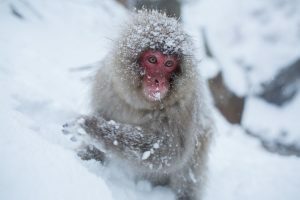 Snow monkeys are found in the subtropical or subalpine deciduous, broadleaf, and evergreen forests of Japan’s three southern main islands viz. Honshu, Shikoku, and Kyushu, as also, on a few other smaller islands. These mammals have two subspecies with the nominate species being Macaca fuscata fuscata, and the second one being Macaca fuscata yakui (Yakushima macaque) that live in the southernmost parts of the Yakushima Island, which is farther away from the mainland where the nominate species live. These are very intelligent and gregarious social primates that live in very large groups and have a distinct class system. Their hierarchy is complicated with more females than males in a single group. However, such rankings can change over time. Each large group consists of smaller subgroups, a system that helps with the group’s organization, though the males are rather loosely-packed and are often seen moving around from one subgroup to another. 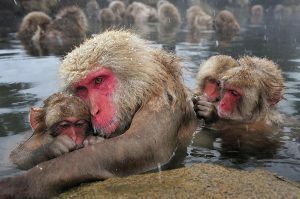 These monkeys are known to love a good hot tub, taking dips in hot springs in groups as part of their socialization. They descend from the surrounding cliffs during the day to sit for hours in the warm waters of the springs and are also excellent swimmers. 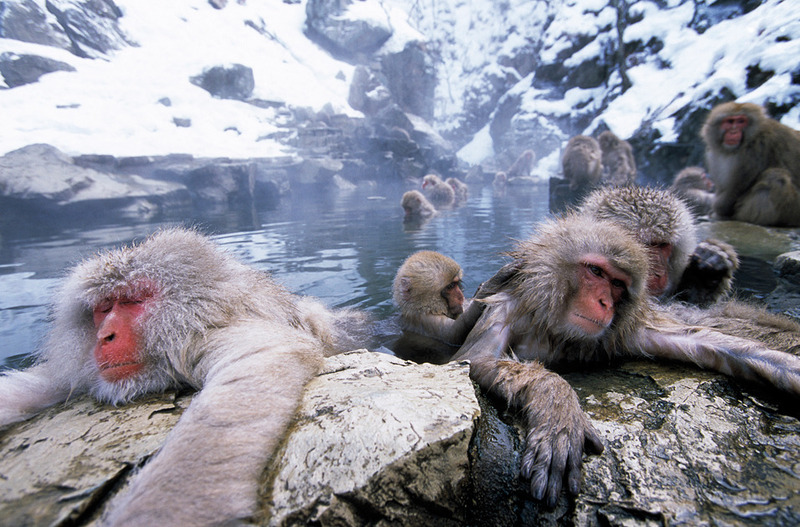 Snow monkeys communicate using plenty of calls, sounds, and vocalizations. Interesting again, various groups can create their own lingo as well, which varies from the lingo of the members of the other groups belonging to other areas. Snow monkeys eat anything. These omnivores are not picky eaters, and would consume anything from fruits, insects, barks, twigs, ferns, roots, to invertebrates, bird eggs, and small mammals. When food is scarce, they will rely on food items like fish, and even soil. 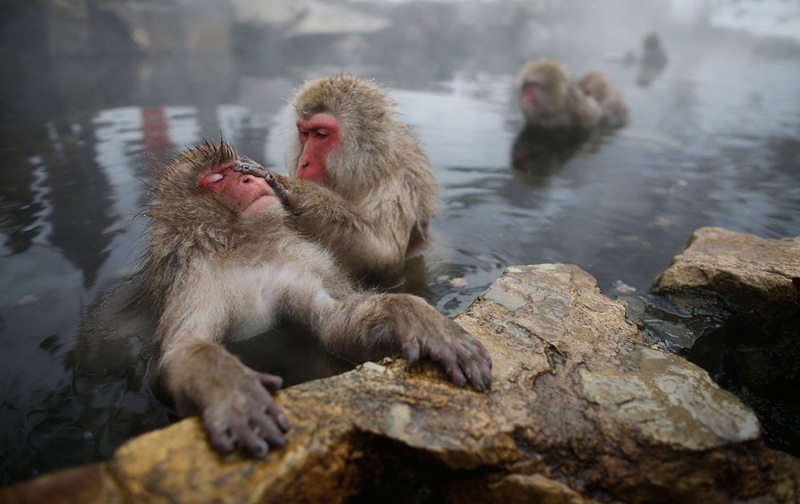 It is not uncommon for the female snow monkeys to spend time with different males during the mating season. It is thought to be a natural way to increase the chances of pregnancy. These primates do not have a specific mating season and can breed all year round even when the female is not undergoing its estrus cycle. However, most breeding happens between September and April. 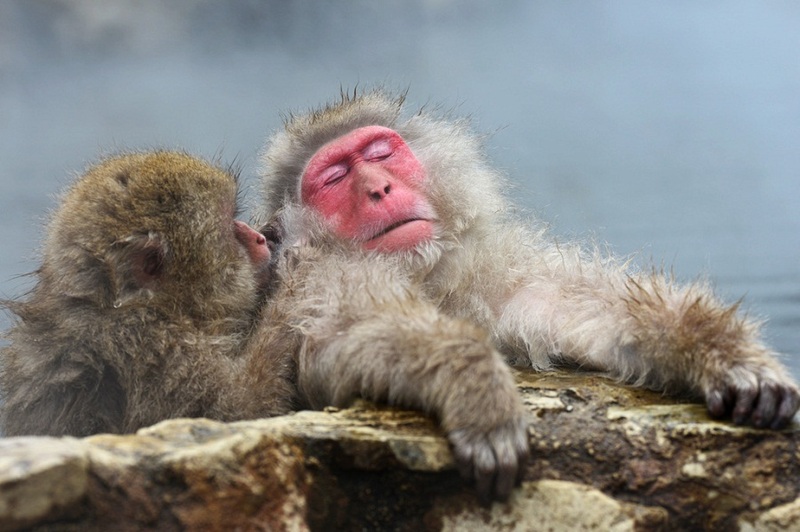 The gestation period of the mother monkey is almost 173 days from the time of mating. When the young ones are born, the mother acts as an excellent caregiver, doting on the offspring right from the very moment they are born. The average litter size is one, while the entire group picks up different roles in taking care for the juvenile. As they keep growing, the baby monkey inherits its mother’s social status on the ladder. Interestingly again, the younger siblings dominate the older ones. The female child outranks any other monkey that is subordinate in status to its mother, including other older female siblings, if any. This means, the ranking among the sisters decreases with the increase in age. The male children leave their families as they mature. The males take around 4.5 years and the females take about 3.5 to attain the age of sexual maturity. The red color of the face is a sign that a young monkey has attained adulthood. 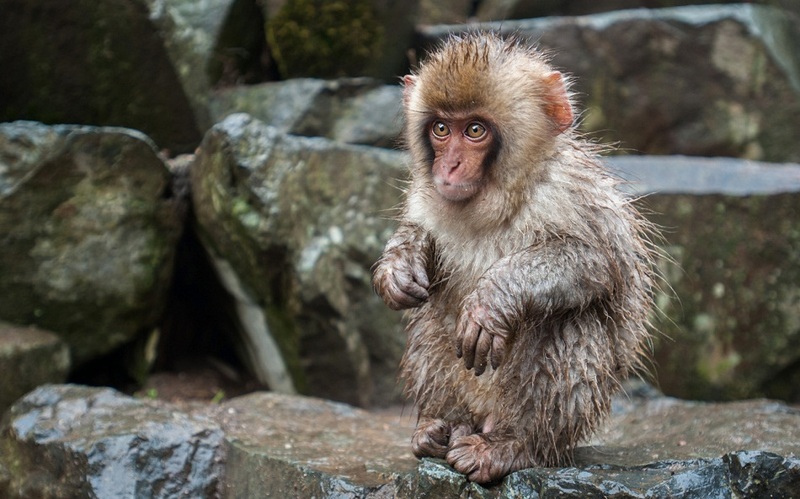 The thick fur of the macaque allows them to deal with temperatures as low as -4°F. Their affinity for hot water baths in natural springs is a behavioral tactic to deal with the extreme weather conditions that prevail in the snow-covered mountains. The primary enemies of this species are feral dogs, mountain hawk-eagles, Japanese wolves, raccoon dogs, as well as humans. A study conducted in 1989 estimated the population of these primates to be 114,431. Considering their current static population count, the IUCN 3.1 has marked them as ‘LC’ (Least Concern). The snow monkeys live farther north than any other non-human primate of the world. 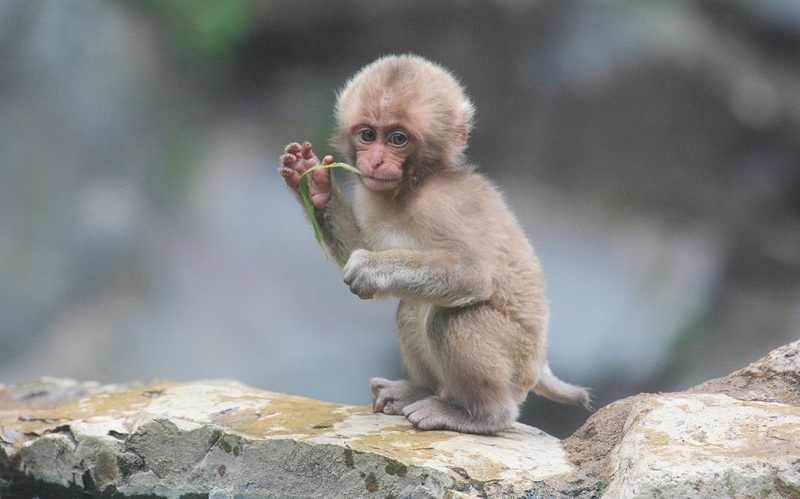 Approximately 10,000 of these monkeys are killed every year in the name of crop protection. Snow monkeys have been seen playing with rocks and pebbles, as well as fond of making snowballs. 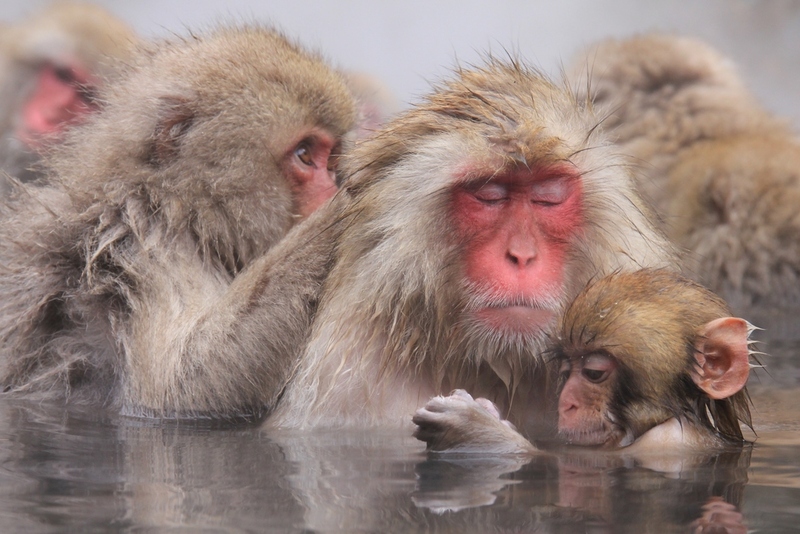 These primates have also been known to wash their food before consuming. They have been reported to swim up to half a kilometer at a stretch. 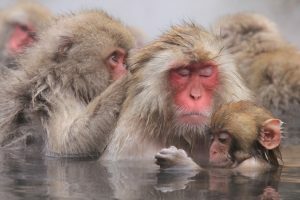 Snow monkeys are capable of developing unique cultures, e.g., a famous female potato-washing snow monkey living in a zoo, named Imo, passed on its cleansing behavior to the rest of its family members. Even years after its death, the entire group practiced washing their food before eating.